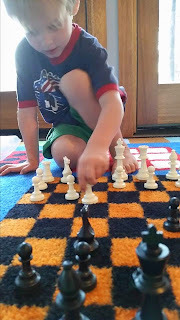 When AJ asks to color with you, it could mean a myriad of activities: checkers, chess, ball toss, watch TV, and even actual coloring with crayons and paper (outlining feet and hands is really fun!). With the new rug in the new classroom, chess has notched up a bit. Of course, AJ has a very unique style of playing, and a very unique set of "AJ rules" to go with it.